You don't like the government? Well, perfect because V doesn't really like the government. It might be because Norsefire conducted strange experiments on him, or it might just be because the idea of anarchy is just soooo enticing. He never leaves home without his Guy Fawkes mask, because who wants the government seeing their face after they commit acts of terrorism? Don't they already see enough?! It's time to take a stance against all the greed and corruption in the governments and corporations in the world, right? Well, Halloween is right around the corner... maybe it's just time to look like your favorite anarchist and hit the dance floor! 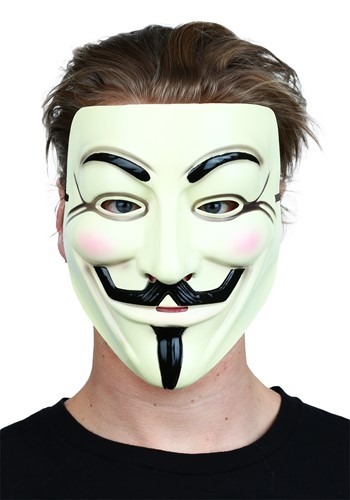 Whatever you want to do, make sure you grab this awesome V for Vendetta Mask. As long as you have plenty of playful banter in your back pocket and a witty comeback for anything, you'll be good to go. Topple the government or hit up the Halloween party scene in this mask, either way, as long as you have this awesome official licensed mask, you'll look both charming and haunting!